Summary G.hn powerline adapter based on Marvell G.hn chipset with built-in AC1200 access point. Wi-Fi network extension seems to be the hot topic these days in the home networking world. "Mesh" wireless makers (eero, Luma, Ubiquti Amplifi) are trying to convince us that we don't need no steenking cables to light up our homes' Wi-Fi deadspots. But other manufacturers are turning to alternative wired techniques to form the backhaul connection between additional access points and central router. In February, we looked at the R7300DST Nighthawk DST Router & DST Adapter solution NETGEAR put together for Best Buy that uses HomePlug AV2 to connect the router and wall-plugged access point. Although it managed to deliver noticeably improved Wi-Fi bandwidth on both 2.4 and 5 GHz through the DST adapter, top throughput was limited by the 1x1 radios in the DST adapter. 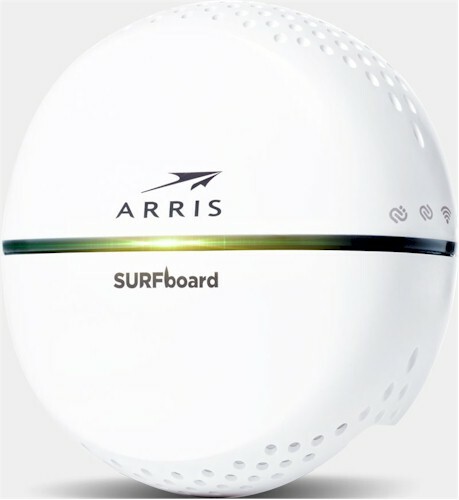 In contrast, Arris has chosen G.hn powerline tech for its RipCurrent line and endowed the SBX-AC1200P adapter we're reviewing today with a simultaneous dual-band 2x2 AC1200 class access point. So if G.hn doesn't get in the way, the SBX-AC1200P should outperform NETGEAR's DST. We've already reviewed the SBR-AC1900P router and SBX-1000P wired extender, so give them a read for more background on G.hn and how Arris' router performs by itself. As the family photo above shows, the SBX-AC1200P looks like a bulked-up SBX-1000P, measuring a little more than 4.5" in diameter and 2.25" thick, not counting its three-prong AC plug. The photo below shows the SBX-AC1200P won't block the top outlet in a standard U.S. duplex outlet. The callout diagram below shows the indicators and location of the switches and Gigabit Ethernet jack. And here's the LED decoder table taken from the User Manual. Like the SBX-1000P, the adapter ran warm to the touch and doesn't appear to have a power-save mode. Since the SBX-AC1200P has Wi-Fi inside, FCC photos were available. The composite photo below shows the first stages of disassembly, with a good look at the significant heatsink sitting atop the main board. The design splits circuitry between AC power and main boards. Both designs use a Broadcom BCM47189 Wi-Fi SoC at their core. But there is a difference between the B0 version used in the Arris and A1 version used in the NETGEAR. The B0 appears to support 2x2 operation, while the A1 is only 1x1. The Arris adapter also has a separate Broadcom BCM43217 2.4 GHz radio. The gallery has more photos of the SBX-AC1200P's innards. Not much on this side except main flash and buffer for the Gigabit Ethernet lines.